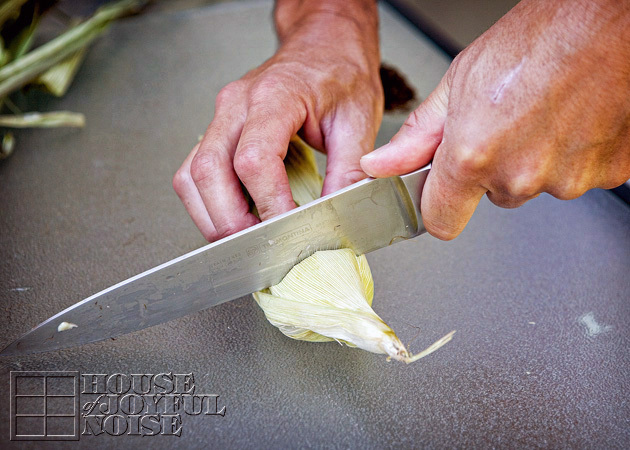 Do you have a recipe that you are known for? You know…a recipe that others consider ‘yours’. Maybe one that’s requested by others for family and friend gatherings, with such expressions as, “Oh, can you make and bring your ___________?”. My mother was known for her baked beans. Some even called them “Jean’s Beans”. My husband is already known for his homemade pizza; which is actually his family’s recipe, handed down. I wondered for some years if I would ever have a recipe others thought of as ‘mine’, until I did. My Jalapeno Jack and Cheddar Macaroni and Cheese! Granted, I think it might only be my own little family here who knows of and requests my fabulous macaroni and cheese but hey….we all start small. And home is always a heartfelt place to start. 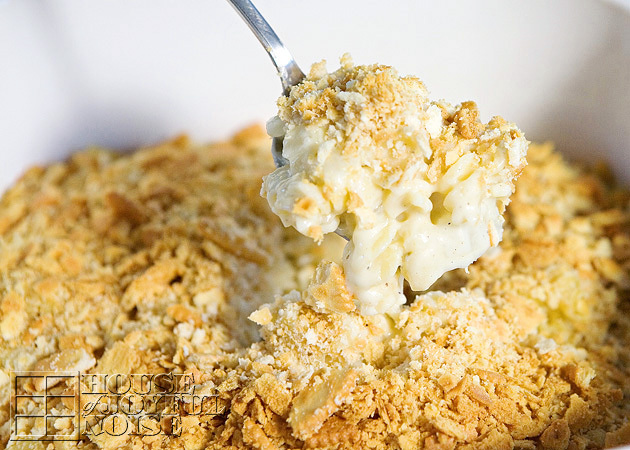 Oh wait, come to think of it, I did make a huge batch of this Macaroni and Cheese (double this recipe=LOTS) to our friend’s 4th of July bash this year; and not only were people eating it up, but she messaged me at 11 p.m. that night to tell me she was eating the leftovers. But I’ve never given anyone the recipe until now. I’m happy to share it with you; our following-friends. (You will want to save this recipe, so you might as well Pin this post with the photo above, now. Make it once, and you may find your loved ones keep asking for it again and again, too. I’m just going to walk you through the steps here as a visual aid, and then I’ll give you the printable recipe at the end of the post. . . . . a sleeve of Ritz Crackers. 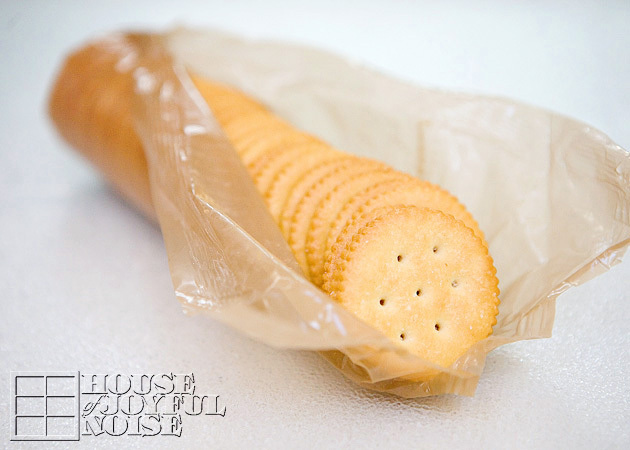 Place the crackers in a zip lock bag, and seal it, removing any air as best you can. Then just crush the crackers all up. Any bits of bigger pieces is fine. See photo above? Good enough. 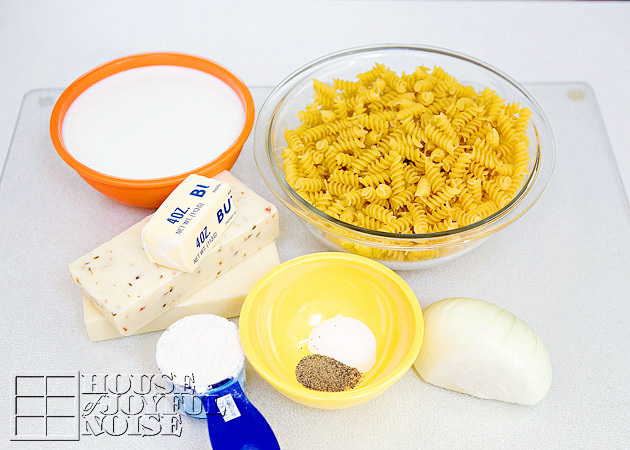 Bring a sauce pan of water to a boil and cook pasta to al dente; 7 minutes, and drain. Put pasta back in (same) rinsed pan. But while you are waiting for the water to boil . . . . In a skillet over medium heat (stove depending), stir butter, chopped onion, salt and pepper until the onion is tender, and appearing more translucent. *Slowly sift in flour, blending it in to the mixture as you go. 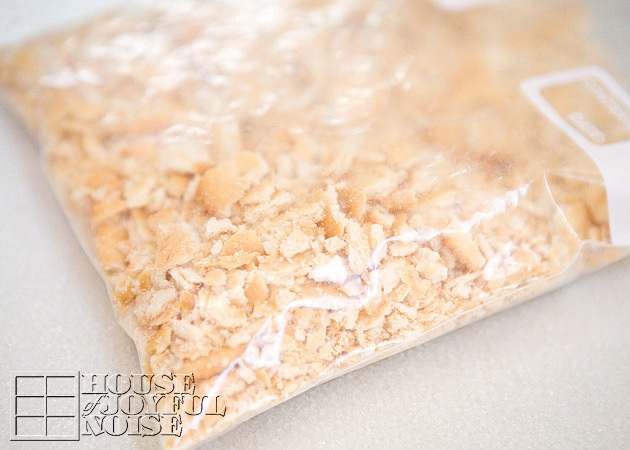 *This will be the hardest part, because the mixture gets dry and crumbly, and it’ll really seem like you don’t need any more flour, when you still have lots to sift in. Just keep working with it. Add a little more butter if you feel you need to, but use at least most of your flour. 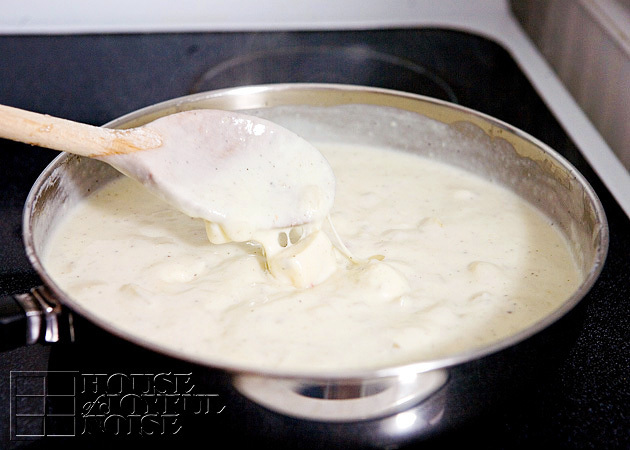 Because remember, this is the base of your cheese sauce you’re about to make, and the flour adds to it’s thickness. Next, and not shown in photos, once the flour is all mixed in, remove from the heat and slowly pour in your milk, stirring as you do. Place back on heated burner, stirring constantly, and bring just to a boil. Remove from heat again, and add all of your cheese cubes. Stir immediately, and place back on heated burner. 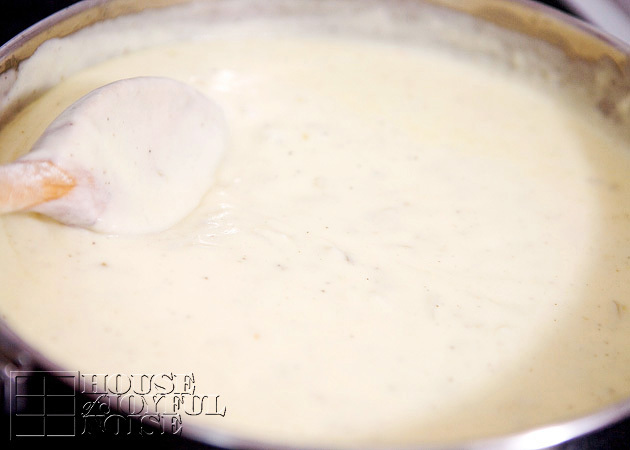 Cheese sauce will be nice and smooth. 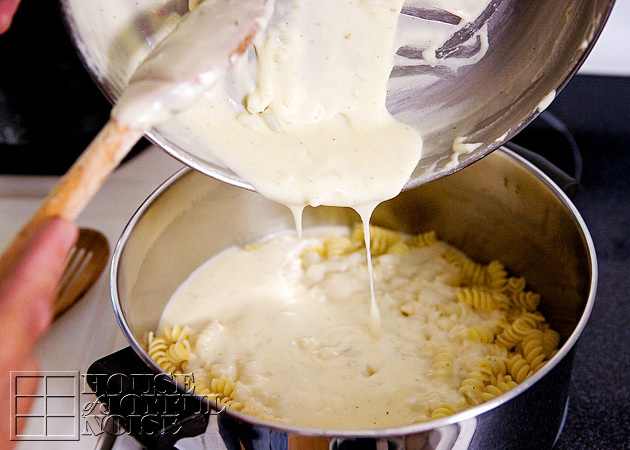 Pour all of your cheese sauce into your pan of pasta. Scrape out every last bit, and mix with the pasta well. 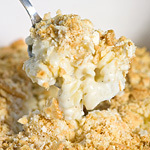 Pour all of macaroni and cheese mixture into an ungreased 1-1/2 or 2 qt. casserole dish. 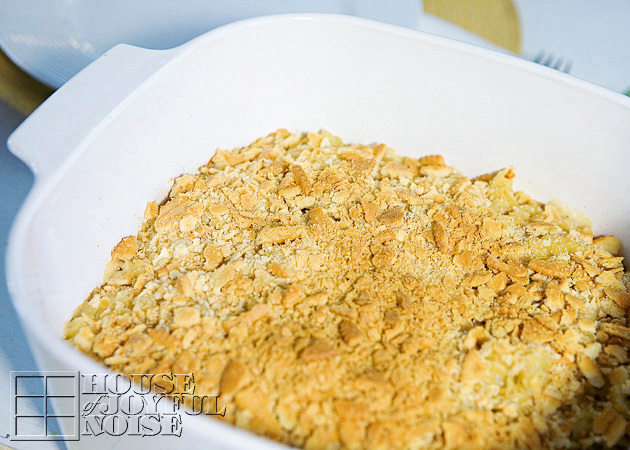 Then sprinkle the crushed crackers all over the top, covering it well. Bake uncovered at 375º for 20 minutes. Look at that! 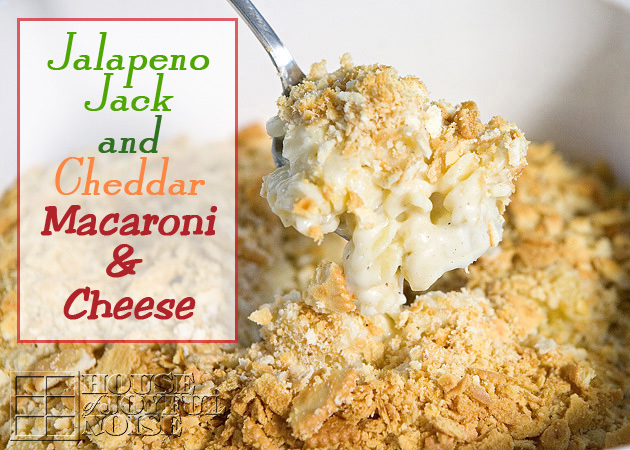 Creamy and cheesy and soooo good, you can only imagine, until you try it! Serve, enjoy and be ready for rave reviews! The buttery Ritz crackers have a slightly sweet taste in complimentary contrast to the slightly spicy macaroni. 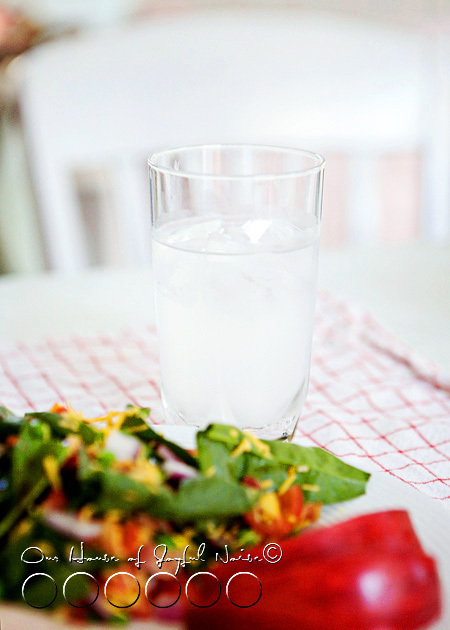 When it is summertime, I want meals that are as simple and quick to make as possible. If we don’t have a tight schedule that day, then we’ve spent the day involved in some project or other. Especially on weekends, when Michael is home too. Usually it’s been it’s blazing hot out all day too, being summertime and all. And let’s face it, the heat and humidity really has a way of draining anyone’s energy and ambition that much more. 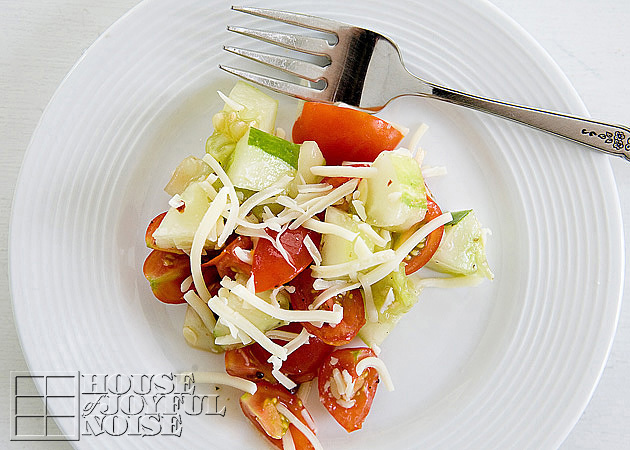 That’s exactly how I happened to come up with this simplest of salads. Dinner was not even planned, never mind started! Michael threw some steaks on the grill, and I just grabbed the vegetables we brought in from the garden that day, off of the counter, and threw together a cold side dish. I was not going for anything grand. And anyway, my kids pop cherry tomatoes in their mouth off of the vine, and they love cucumber spears, with or without a dash of pepper. The big surprise was that it was far more delicious than I had even begun to anticipate, and it was the talk of dinnertime too. 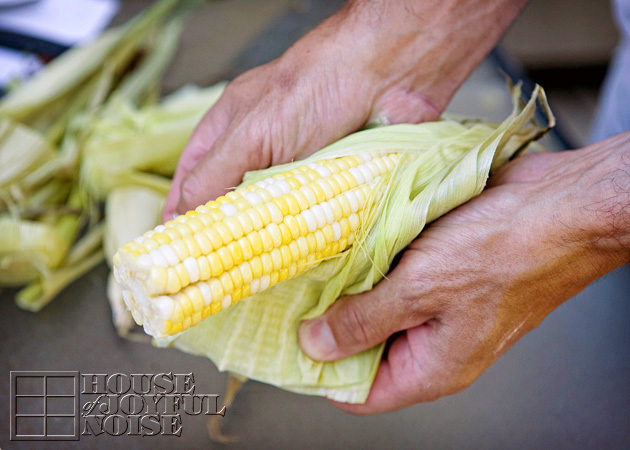 We need to have a variety of options, to use the abundance of certain vegetables we get out of our garden almost daily, in the summertime. Here’s one day’s picking, carried in my skirt. 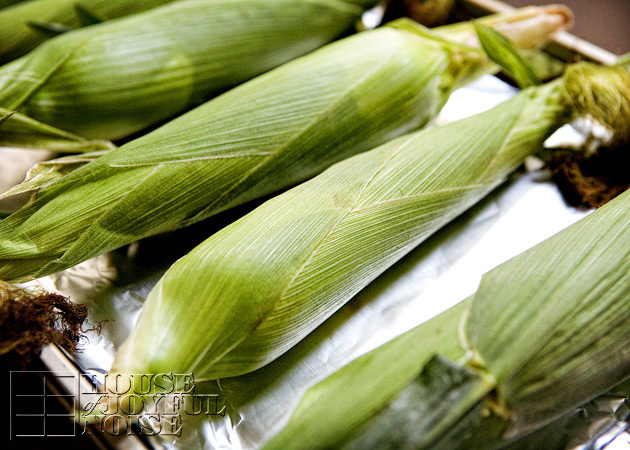 It’s likely that the next day will harvest about same amount, ready for picking, again. 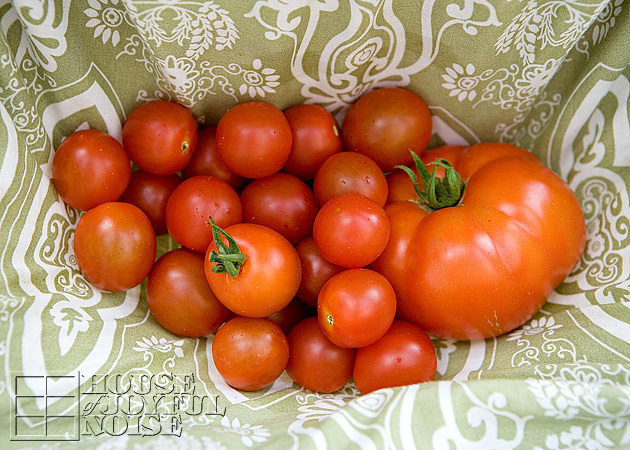 Especially given that Olivia has her own garden this year, too, and is also growing cherry tomatoes. She’s growing the cucumbers alone, but she shares with her siblings at lunch sometimes, or for a snack, and she’s happy to offer one for our dinner anytime, as well. 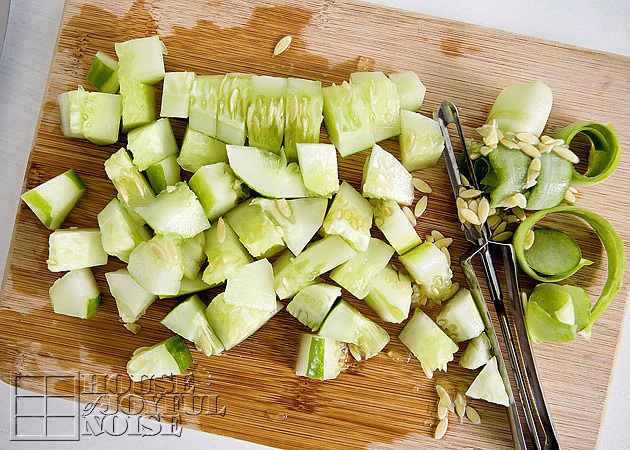 Cucumber, quartered the long way, and then chopped. 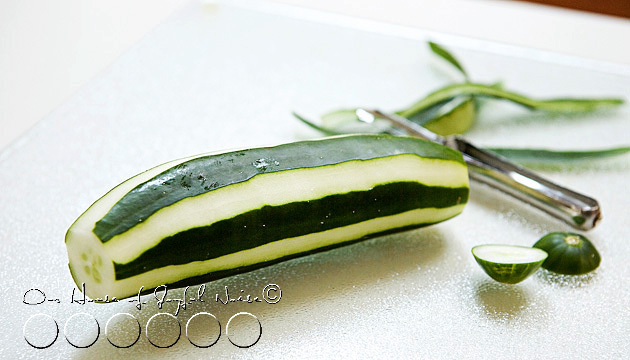 TIP: I always stripe my cucumbers with the peeler. It makes them a littler fancier looking, and even more enjoyable. 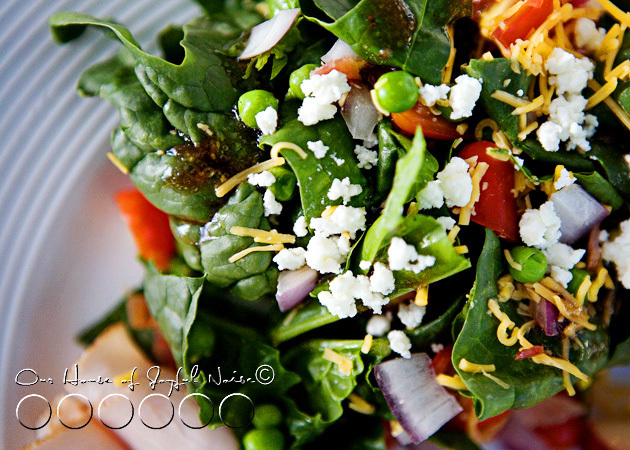 Throw in a dash of kosher salt, and drizzle all over with Balsamic Vinegar Salad Dressing. 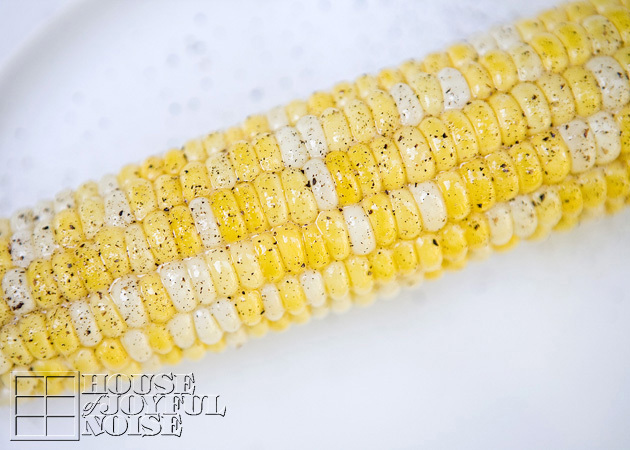 We also add black pepper, because we love it, and put it on just about everything. The dressing, as opposed to straight up balsamic vinegar, has all kinds of little bits of seasoning goodness already in it. Give it a quick toss. I like to let it marinate just like that for a few minutes. 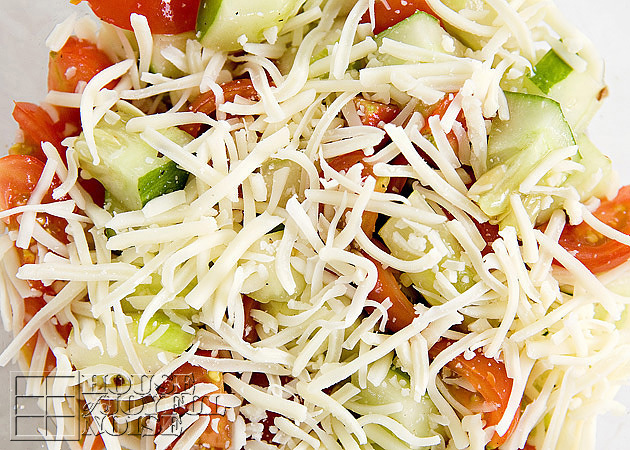 When it’s time for dinner, I throw some shredded mozzarella cheese on top. It’s done. Does it sound plain, to you? Well I’ll tell you what . . . . . .
It’s simple all right, but it’s sure not plain tasting! The tang of the Balsamic Vinegar Dressing, really brings out the sweetness of the cherry tomatoes. The combination of the two compliments each other so well. 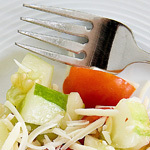 The fresh cucumber, and the soft and subtle flavor of the cheese adds a new texture, and another surprise taste. We have also used this salad, rolled up in a tortilla, with grilled chopped chicken. Also simple, quick, and delicious. This is what summer tastes like. 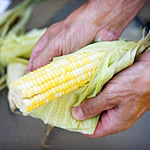 What is your simplest summer dish? It’s a wonder, that our children have not turned into cucumbers, this summer. They love them, and our gardens have been so generous with them, that the kids have happily eaten them many days for lunch, dinner, and sometimes even as a snack. 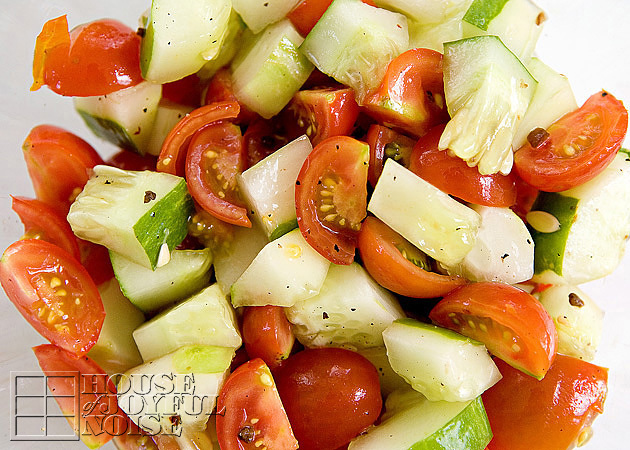 They’ve had them as spears, sliced the long way and added to their tomato sandwiches, chopped up in a garden salad, and as this Cucumber Salad, which we are sharing with you today. We know. It’s not the most inventive recipe, if we can even call it that. The ‘recipe’ is actually more about the dressing it’s in. It’s one that I imagine has been around a long time, as my mother used to make it while I was growing up. Recently we were at our friend’s house, getting our families together, and they made us the most de-li-cious dinner. Part of that meal was a simple romaine salad with sliced fresh strawberries, and a dressing very similar to this one. So as you take note of this dressing, keep in mind the various or creative ways you can use it for, too. 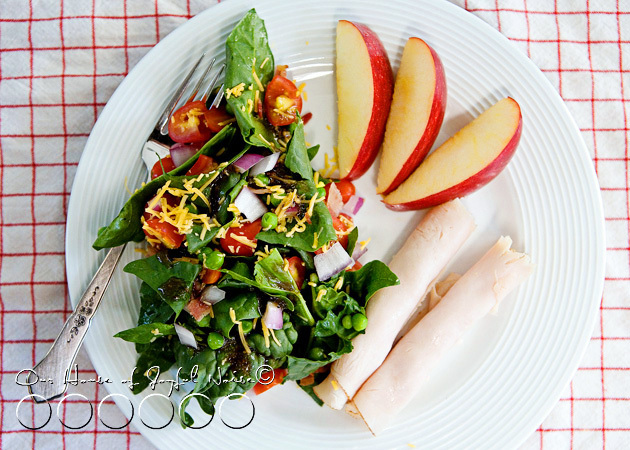 This dressing, and this salad, is a perfect summer-side, to a light meal. 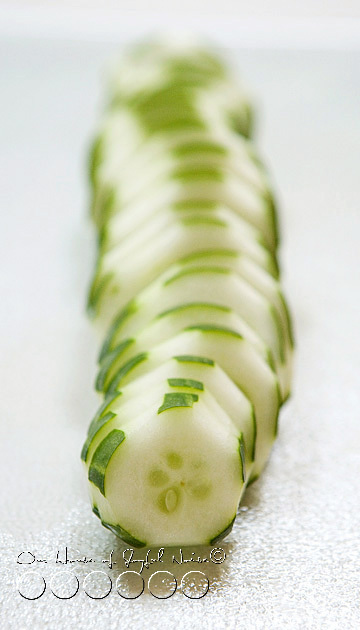 Our Cucumber Salad begins with a fresh organic cucumber, from our own gardens. 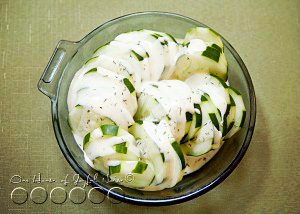 I have always, peeled cucumbers in stripes. But there have been 2 separate reasons I have done so. In the off-season, I have peeled the grocery-store bought cucumbers this way because, as we all know, the majority of the vitamins & minerals are in the skin, and I want to get all I can into my kids/family. 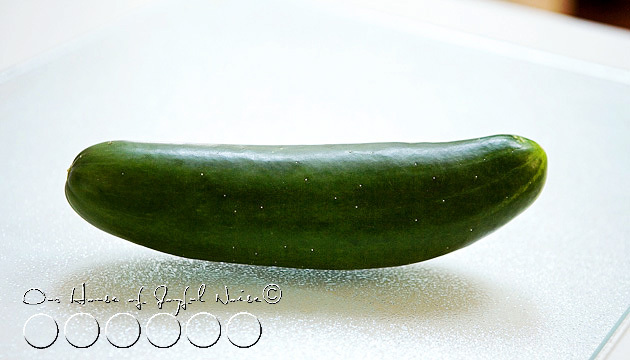 But also, before we ate organic, the cucumbers from the store were usually waxed. Man I hated that! I couldn’t stand the feel of it trying to wash them, (the wax never came off), and the funny feeling it left on my hands too. Also, we just weren’t partial to eating wax. You? 😕 So, peeling the skin in stripes, was a compromise, of sorts. But even when the cucumbers are organically right from our gardens, I think the stripes just make them fancy & pretty. So I chop off the ends, and stripe peel them. And then I slice it. And maybe I’ll have fun taking photos of it. 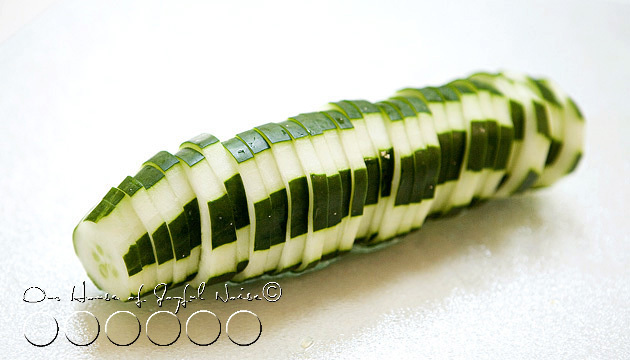 It’s a cucumber caterpillar!! So much for not playing with my food. Now I know this is silly, but, I didn’t take photos of making the dressing. It would have been boring, and unnecessary. It’s so simple though, and there isn’t actually ‘correct’ amounts of any one ingredient. It just matters more of how thick you want the dressing, and how much you like this or that ingredient. All to your preferred taste. But this is generally my winged recipe, I mix in a bowl well, with a fork. 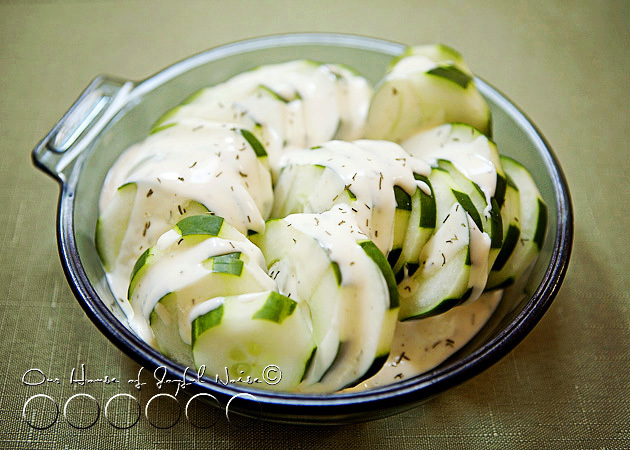 In my antique blue Pyrex dish (missing the handle), that was once my grandmothers, I arrange all of the cucumber slices, and drizzle the dressing right over it. Then I throw another dash of dillweed on top. This dish is light, tangy, sweet, with a tad of salty. All at once. 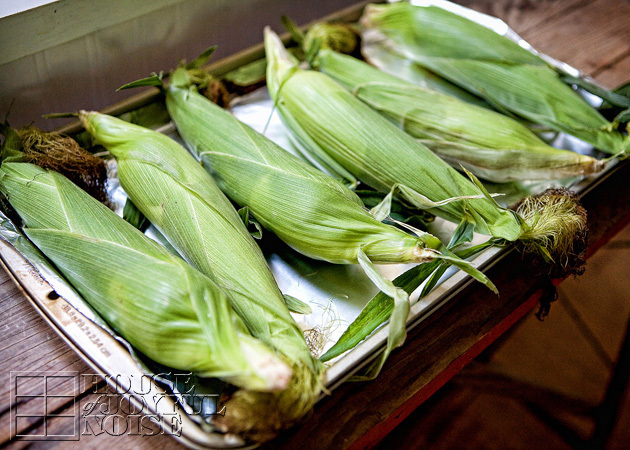 More importantly, it’s FRESH, light, delicious, easy, and well……COOL! It’s a perfect side for summer grilled dinners, etc. If you live in a climate where summers can be hot & humid, than you probably have days like me when you can’t even think of cooking dinner, in a hot kitchen. You’re looking for a meal that is cool, light, and delicious. We probably all have our regular stand-bys, but I just discovered a new favorite, and I’m here to share it with you! 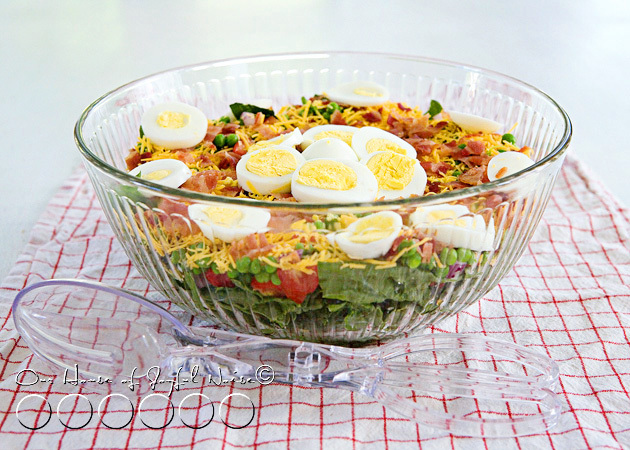 I think the name alone, 7 Layer Salad, is FUN, and sound enticing. And the great thing is, if you don’t care for one of the ingredients/layers, you can substitute it with something you prefer, and still call it 7 Layer Salad! But we made it just like the recipe called for, and it was a hit in our mouths, and our bellies. Some fresh and cold rolled-up Turkey meat & Apple slices. 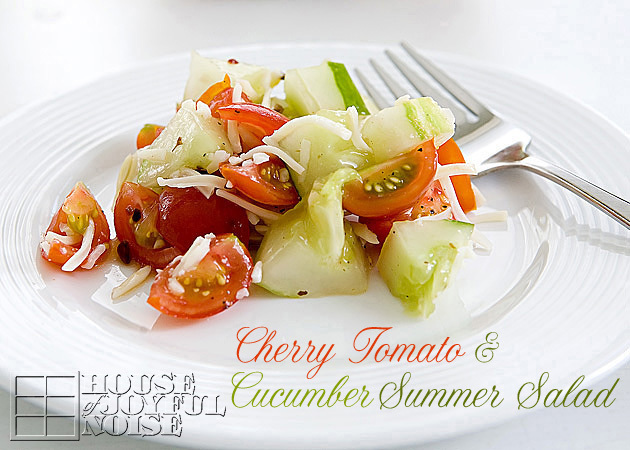 Serve with a tall glass of cold lemonade, and you have yourself a perfect and light summer meal! Lunch or dinner! As a salad dressing, consider Balsamic Vinegar, or a Raspberry Vinaigrette. My kids love both, but yours may prefer their regular favorite. As if this meal wasn’t perfect enough to me, I added my favorite topping. Most every salad is ‘betta, with Feta’. Of course, you have the option of swapping out any ingredient layer you don’t care for, and swapping in one you do! 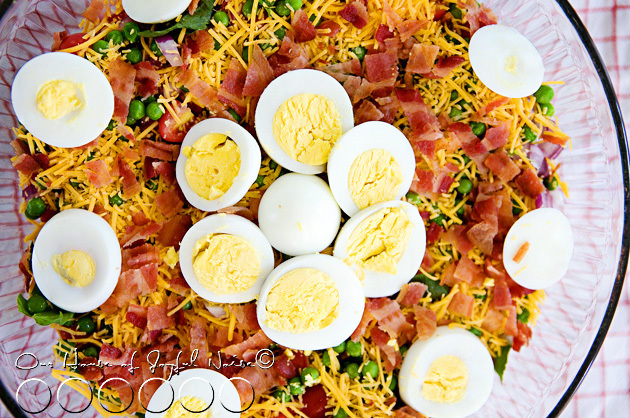 What changes might you make to your layer salad?